The idea of multi-functional furniture doesn’t have to stop with our sofa beds and ottoman coffee tables. This unusual sofa is convertible in so many ways that it almost seems exclusive to call it a sofa. It goes from a traditional sofa configuration to a bevy of other shapes with little effort to make a big impact on the style and comfort of a room. Designed by the Zuiver creative team from Holland, the convertible sofa lets each sitter customize his or her own ideal seating experience. Need some head support? A place to prop your feet? A way to comfortably stretch out your legs? Even if the person sitting next to you wants a totally different experience, you can have exactly what you want. The secret to the furniture’s flexibility is the cushions, footrests and headrests which can be adjusted to a number of positions to suit the users. 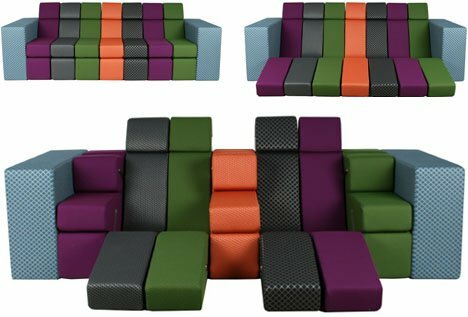 Folding each modular cushion up or down invents a whole new shape with different points of support. Lovers who wish to sit closer to one another can unfold the seats and the central armrest module to create a cozy snuggling nest. More casual acquaintances can keep their distance in a number of ways. Overnight guests would find the completely-unfolded shape spacious enough for a night or two of visiting. While the grey version is absolutely gorgeous, the designers have also created a multi-colored prototype that further highlights the modular nature of the sofa. A small loveseat sized piece is also part of the suite, but the loss of size greatly detracts from the impressive functionality of the design.